At Harvard, the Jewish student group Hillel was barred from co-sponsoring a discussion with a Palestinian student group. At Binghamton University, a Hillel student leader was forced to resign his position after showing a film about Palestinians and inviting the filmmaker’s brother to speak. And on many other campuses, Hillel chapters have been instructed to reject collaboration with left-leaning Jewish groups. At American colleges, few values are as sacred as open debate and few issues as contested as the Israeli-Palestinian conflict. But Hillel, whose core mission is to keep the next generation of Jews in the fold, says that under its auspices one thing is not open to debate: Those who reject or repudiate Israel have no place. This month, the students at the Swarthmore Hillel rebelled, declaring themselves the first “Open Hillel” in the nation. They will not abide by Hillel guidelines that prohibit chapters from collaborating with speakers or groups that “delegitimize” or “apply a double standard” to Israel. The Hillel dispute has amplified an increasingly bitter intra-Jewish debate over what is permissible discussion and activism about Israel on college campuses. In a major step affecting that dispute, professors in the 5,000-member American Studies Association voted this month to boycott Israeli academic institutions over Israel’s treatment of the Palestinians. Hillel’s defenders say that in an atmosphere so hostile to Israel, Jewish campus organizations must draw parameters and that this is why Hillel established new guidelines in 2010. 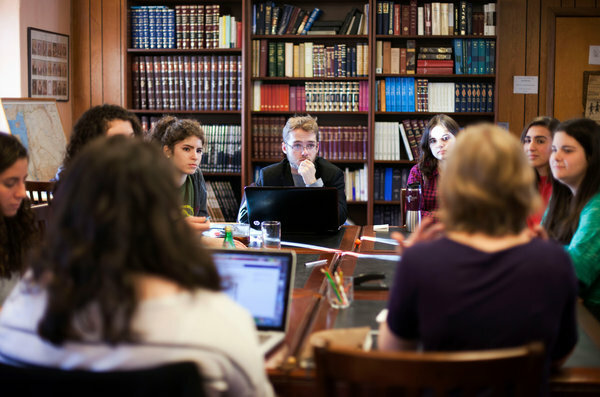 In interviews, some students said that college should be a place for no-holds-barred discussions about Israel and that Hillel should host those discussions, since Hillel emphasizes inclusion and takes its name from a rabbinical sage who welcomed intellectual challenge. A nationwide online petition in support of the Swarthmore Hillel’s rejection of those guidelines has gathered 1,200 signatures. But some students active in Hillel say the lines are either muddy or wrong. Hillel’s adult staff members on more than a dozen campuses have refused to allow J Street U, an affiliate of the liberal group J Street, to co-sponsor events. The explanation was that donors to Hillel do not support J Street, which supports a two-state solution to the Israeli-Palestinian conflict but is critical of Israeli settlement building and the occupation of the West Bank. J Street is challenging the dominance of the more conservative establishment Israel lobby, the American Israel Public Affairs Committee. Leaders of Hillel and Aipac recently published an essay in The New York Jewish Week hailing their partnership on campuses. In contrast, the leaders of Jewish Voice for Peace, a group that supports the boycott and divestment movement, say their organization has been unable to affiliate or work with any campus Hillel in the United States. Hillel chapters have also shunned collaborations with Palestinian student groups, which tend to support boycott and divestment. That is what happened at Harvard. Hillel held a dinner with about 15 students for Avraham Burg, a leftist former speaker of the Israeli Parliament. The students then walked over to the Quincy House dormitory for Mr. Burg’s speech — Hillel refused to host the speech because it was co-sponsored by the Palestine Solidarity Committee. Showing documentary films about the Palestinian experience has also caused friction on many campuses. In one case, Benjamin Sheridan, a senior at Binghamton University, part of the State University of New York, said he arranged a showing last year of the Academy Award-nominated film “5 Broken Cameras” and a talk by the filmmaker’s brother, a Palestinian angry about the occupation of the West Bank and East Jerusalem. The event was sponsored by Dorm Room Diplomacy, a student group that holds video conferences between American and foreign students. Mr. Sheridan, 21, wears a wristband that says “Israel Is Strong” in Hebrew. He spent his gap year in Israel, has an Israeli flag in his dorm room and did an internship at the American Jewish Committee. Misleading from the outset, this might better read: "Hillel authorities bar members at Harvard from co-sponsoring... "
That might be more insulting to the over-riding authority, but why shouldn't it be? They're blocking free association. Why don't these 'left-leaning' students - who want a more reasonable approach for good reasons, including thir own standing in the wider community - stand up to Hillel and form an alternate kind of club? Are they so bound by other pressures to accept this harsh political indoctrination? The ADL goes ballistic at any insinuation that Jews congregate for a singular purpose. However, one look at the purpose of forming an organization suggests otherwise. Isn't one of the primary reasons for forming an organization to set an agenda or common goals? Jews have hundreds of organizations and an endless supply of funding with media and legal strategies in place. Before even arriving here from Eastern Europe, Jews were defining their "other-ness" from the goyim by collectivism or "group think" in PC parlance. It will be interesting to see where this leads, as if individual Jews go against the grain of their leadership. Usually, all it takes is a few accusations of "self-hating Jew" to quiet any dissension. Page created in 0.078 seconds with 21 queries.